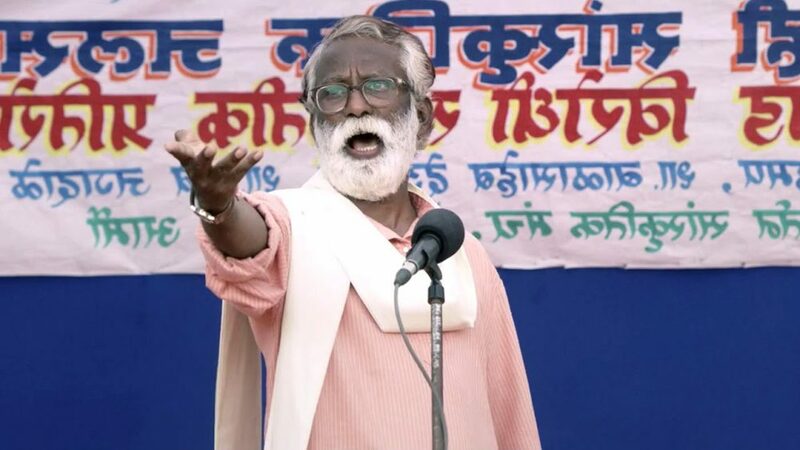 The apparent ‘suicide’ of a sewage cleaner in Mumbai leads to the arrest of Dalit activist/folk singer (Vira Sathidar). The 65-year old man is held on the bizarre grounds of abetting the suicide through performing an inflammatory song which might have incited the worker to commit the act. As the trial unfolds, the personal lives of the lawyers and the Judge involved in the case are observed outside and inside the court. COURT is a quietly devastating, absurdist portrait of injustice, caste prejudice, and venal politics in contemporary India. Drawing inspiration from multiple sources such as the tradition of lok shahirs (folk singers) of Maharashtra, protest singer-activists such as Gummadi Vittal Rao aka Gaddar, and the case of Jiten Marandi-a tribal activist of Jharkhand who was wrongly accused and sentenced to death in the 2007 Chilkari massacre case and eventually released, Tamhane took a year to write a fine multilingual screenplay in Marathi, Hindi, Gujarati and English. “The film works so well thanks to an intelligent, superbly understated script and a feel for naturalism that extends beyond mere performance” Variety. “Court is a film for the thinking viewer and requires you to evaluate scenes using your brains” Times Of India.